Aluminum profile horizontal stretch Wrapper Machine special design for aluminum, bar, copper tube packaging and rod... The machine was well received by market. Not only it is high efficiency, energy saving , but also greatly saving manpower and material resources. Many types of aluminum packaging machines available, such as aluminum profile bundling machines, timber feeding machine, 3 sides covering machines. The solution can be semi-automatic to full automatic packaging line. PLC & HMI for flexible handle a variety of load sizes. Widely built with high productivity, cost efficiency and longevity. Different program for auto/manual swift control. The inverters for wrapping and conveying speed changing. Overlap adjustment for both material save and seal package. Ideal wrapper for aluminum profile. 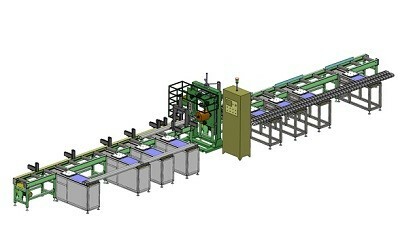 Automatic film and material cutting and feeding for the bundles. Automatically show the operation error both indicator and touch screen. Nice to ocks aluminum profile together and reduce profile shifting, product damage. 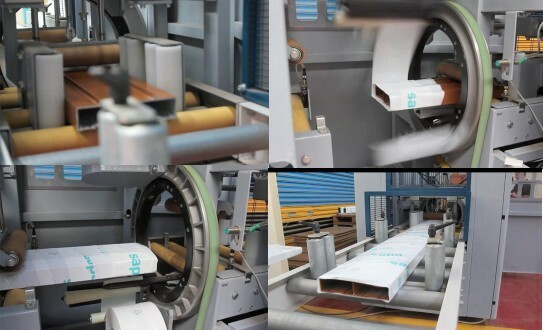 It is solution for aluminum profile wrapping and bundling in automatic mode. 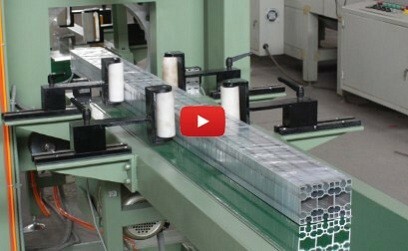 This wrapping machine is made by tight steel frame. The operation friendly design help to replace the packing material very quickly (less than one minute). The profiles are automatically in-deeding and holding by a series of rollers through a machine which allowing different sizes of packages to pass automatically without stopping. The ring rotates upto 100rpm for covering of the film on the surface of the aluminum profile, which is supported by the axis and has a special clutch to keep the tension constant until the material roll is finished. The packing speed is controlled by an electronic converter. When the wrapping or packing material is tearing, the automatic device can detect the machine completely stop and alarming.The machine is designed as a "start and stop" mode. The blade automatically cuts off the packing material at the end of each packaging cycle. The binding time can be set according to the requirements. The conveyer belt is designed and conveyed to the feed roller of the machine. 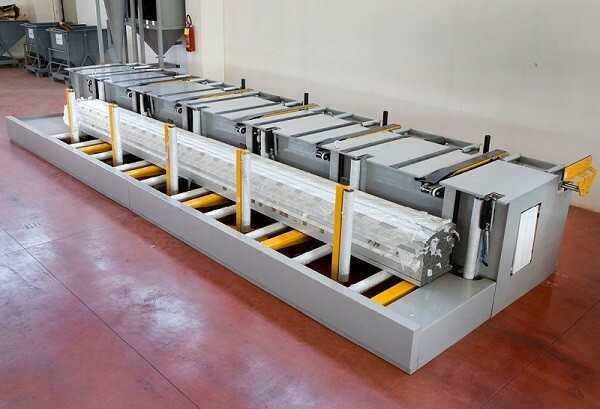 The belt conveyor is equipped with supportive holder which can travel to a certain space and each package automatically from continuous packaging.